Pardon the weird quality, it is a picture of a picture after all. 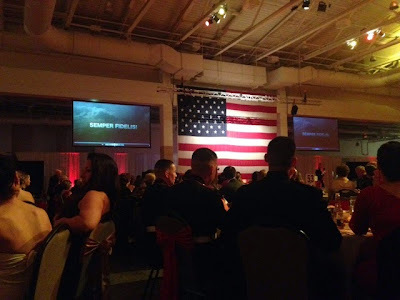 This past weekend we attended the 239th USMC Birthday Ball for SOI in Wilmington, NC. 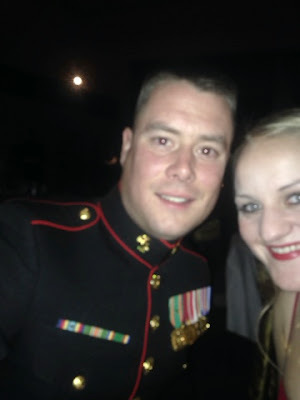 Even though Ryan is still in student status we decided to go to the SOI Ball rather than the ball his old unit was having (and the fact that one was on Saturday and one was Sunday had nothing to do with that decision!). 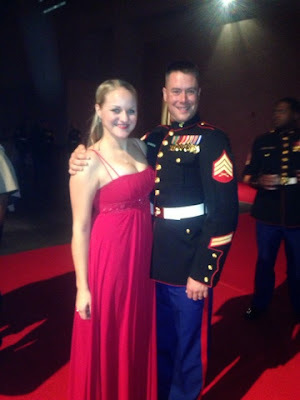 Last year, Ryan was deployed during the ball season so we were pretty excited to go this year. 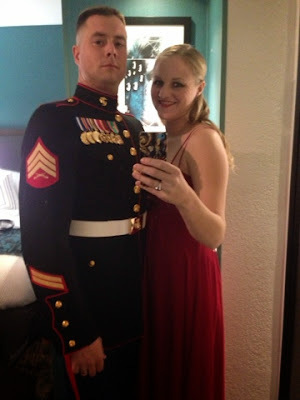 I love seeing my husband in his dress blues and I love having an excuse to dress up. This year I wore my bridesmaid's dress from my best friend's wedding this past May... military spouses are definitely some of the few people in this world that wear them again! We decided to make a weekend of it and get a hotel in Wilmington so we didn't have an hour drive home that night. We get to the hotel, grab some hot drinks since it got cold literally overnight, and then Ryan realized he hadn't gotten a hair cut! So he went off to do that while I got ready. Naturally the day of the ball I had a huge breakout on my face, I cut my leg badly in the shower for the first time in months, and for good measure I wacked myself in the neck with a hot curling iron as I was doing my own hair. Geeze. Top that off with still feeling off from my gall bladder I barely ate all day. At least from far away you can't tell that I felt like a walking hot mess. We took a cab to the Convention Center (all $4 it cost us) since it was chilly and got there with time to mingle. We got our Professional pictures taken early on since I knew Ryan has zero patience for such things and once we got going it would never happen. This year's picture (seen at the top of this post) is probably hands down our best one to date! We were both pretty stoked. I know it was good because my non social media using husband switched his facebook profile picture for the first time since 2011.... seriously. Another new thing, we had to all get stamps inside our wrists if we were over 21 and wanted to drink, that was diferent for sure, but we were definitely buying us some overpriced alcohol so we obliged. It was nice to meet Ryan's other fellow students I had heard so much about. 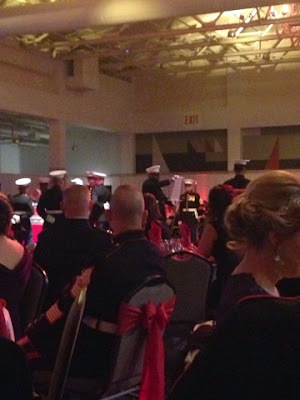 For the first time since we went to a ball in DC years ago I was pretty thrown by all the "brass" in the room. So many officers and higher ranking enlisted, it was a tad bit intimidating truth be told! The itty bitty PFC that was the youngest Marine this year must have really felt it. She was born in 1996, the same year as my baby brother who is still in high school! Oy! Ryan and I bet on the year they'd be born, I sadly lost. We had a decent view of the ceremony and the video, which dorky me absolutely loves every single year. This year got me teary (not a first) because the battles they mentioned in the video I know my Poppy fought in during WW2. Seeing some of the footage, especially talk of the bloodiest battles of the war at Peilalu and Guadalcanal, and knowing my Poppy was there was hard to wrap my brain around. Have existed since time began. 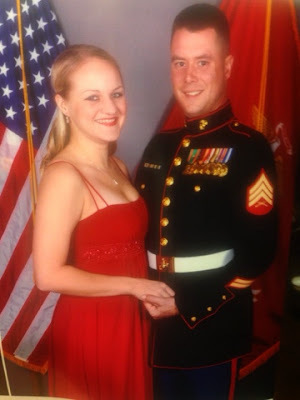 of one drunken Marine for another." 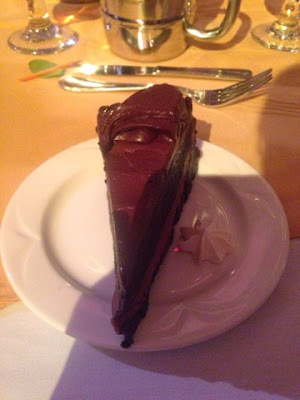 Now even though my stomach stinks I nibbled on some delicious food, the highlight being this chocolate cake. It was hands down some of the best chocolate cake I have had in my life. Seriously. I wanted to take what I could not finish home with me to eat later. If it could have fit in my purse I probably would have! Thankfully one of my husband's fellow students was nice enough to take a picture for us... that one thankfully came out nice too! The large red carpet they had leading to the dance floor was a nice touch if you ask me. We danced and hung out for awhile, had a few drinks, before everyone decided they wanted to go out. Any of you who know me know I am not a big partier by any means... but I did my best. We went back to our hotel to change because, well, really it was too cold for most of us! We started at City Limits, a country western bar that I was more than happy to stay in, especially since our cover fee was waived, but we were in the minority. 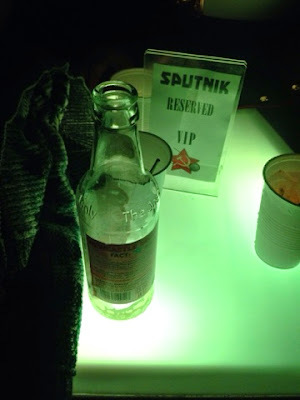 Instead we ended up at Sputnik, another nightclub. Definitely not my typical scene, give me a quiet pub with trivia any day, but I made it a good three or four hours before I begged my husband to have us leave! 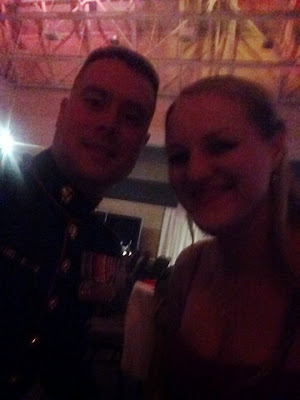 Aside from a drunken pizza detour (for the Marines sadly, not me) we eventually collapsed into bed way past my bedtime. Someone stole the VIP sign from another table after we managed to snag one... we aren't that cool, I promise! 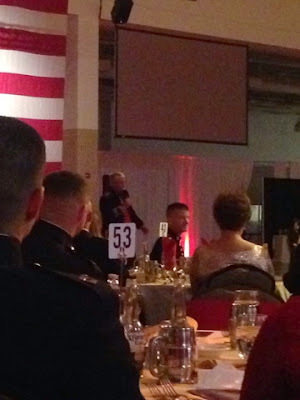 All in all, another succesful Marine Corps birthday in my book! Happy birthday Marines! LOVE that poem!! I'm so jealous...I miss the ball so much!! You might s felt like a hot mess but you looked amazing!!! It sounds like yall had a great time! Haha thank you!! We did!